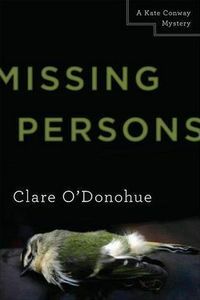 Missing Persons by Clare O'Donohue: Synopsis and Online Purchase Options. Synopsis (from the publisher): The cause of death is "undetermined," but the cops peg Chicago television producer Kate Conway as the main suspect when her soon-to-be ex-husband, Frank, is found dead. To make matters worse — and weirder — Frank's new girlfriend suddenly wants to be friends. Happy for the distraction, Kate throws herself into a new work assignment for the television program Missing Persons: The Story of Theresa Moretti, a seemingly angelic young woman who disappeared a year earlier. All Kate wants is a cliché story and twenty-two minutes of footage, but when the two cases appear to overlap, Kate needs to work fast before another body turns up — her own.